Oh my, how the world of local search has changed over the past 16 months. Heck, how it’s changed over the past month! It used to be that by localizing your content, claiming your site, and scooping up local citations, small business owners put themselves in a good spot to achieve high visibility in the search results. However, things have changed and they’ve gotten increasingly more complicated. As we approach 2011, I thought we’d take a look back at our 2009 post Small Business SEO: How To Launch That Web site to see what’s changed and what SMB owners need to know for the coming year. Take good notes because there will be a quiz later. The quiz is called “Google”. I know. In an ideal world, a rash of new things entering the fray would mean that others had been de-valued, allowing you to shift your focus. Unfortunately, that’s not so much the case here. Small business owners truly have their hands full in the new and improved world of local. And you can blame Google for that. What all of this means is that if you haven’t finished the list we created for you last April, well, it’s still waiting for you. And you’re late. Do localize your content, claim your listings and find places to earn citations that will help Google associate you with a particular area. However, once you’re finished, there’s more. So keep going. In April 2010 the world of local changed forever. It’s when Google made its local intentions clear with the release of Google Places. Just as Google had always prided itself in organizing the world’s information, Google Places looked to organize the world’s businesses. To date, more than 50 million places have been created. If yours isn’t one of them, you’re behind. This is something you can’t ignore. To claim your Google Place Page, head over and add your business if it’s not already there. Fill our your profile with your basic information, service areas, payment options, hours, videos, photos and any other additional information that you feel is relevant. It’s really important that you take the time to fill out each and every section, including the area of photos. On October 27, Google showed a serious change to the search engine results page with Place Search What it did was replace the old local 7-pack with comprehensive local listings that put related business images and reviews directly under your Web site listing in the SERP. Yeah, they’re right there for everyone to see. It’s massive. If you haven’t checked it out, do so now. You’ll start to see just how important your business’ Google Place page is. As I mentioned, fill out every field. Many sources have stressed the importance of having a score of 100 on your Google Place Listing. Yes, I know, no one likes filling these things out but it’s important. Don’t give me lip. Include relevant keywords that best describe your products and services. That means not only including keywords relevant to what you do, but also where you do it. This is local search after all. Make reviews a priority: Reviews are becoming increasingly important for a number of reasons (which we’ll cover in a bit), however, in the world of Place Search, reviews for your business are appearing directly underneath your Web site listing. There’s no avoiding them, especially now that Google has, itself, gotten into the online review world. There’s been a lot of activity happening with Google Places lately and, truthfully, it can be hard to stay on top of it. If you can only look toward one source to help you find the signal in the noise, I recommend Mike Blumenthal’s awesome local search blog . Google Places isn’t the only new addition that small business owners should be aware of. There’s been a lot of activity by social sites to get in on the local craze and to create resources for small business owners. While the numbers aren’t necessarily here (yet) to make these a huge priority, I would encourage small business owners to at least set up a presence and look for any potential. Facebook Places: Rumor is approximately 30 million of Facebook’s 150 million active users (that’s 6 20 percent for the math geeks) have tried Facebook Places. And while they’re nowhere near as active as rabid FourSquare users, the sheer size of Facebook’s audience means your business should be represented there. Even if you don’t plan to do much with Places right now, make sure your business is listed and that you’re watching who’s checking in. The first step is to go to go to Facebook.com to check if your business is listed. If it’s not listed, you can add it by going to Touch.Facebook.com or accessing Places via the iPhone or Android app. If it listed, then you just have to claim it by clicking on the [is this your business?] link at the bottom of the page and going through the manual verification process. Once your listing is claimed, you’ll be able to merge your Facebook Place page with your company page. You can read more about how to do this via the Facebook Places Guide for Businesses. Twitter Places: This past summer Twitter launched Twitter Places to give users “more context” for their tweets. Twitter Places allows users (and business owners) to ‘tag’ their tweets with a specific location. While we haven’t seen too much activity with Twitter Places over the past few months, there are rumors Twitter will soon be allowing business owners to claim their listings. While we wait for this to happen, I’d encourage SMB owners to set themselves up by at least creating a listing for their business. To do this, you’ll have to turn on Twitter’s location feature. When you tweet with geo-location signed on you’ll see an option to add your location. Once you click on it Twitter will show you a list of nearby places (if there are any) or you’ll be asked to add your own. Like I said, we haven’t seen much from Twitter in terms of building this out, but who knows what’s on the horizon. Set your location now. 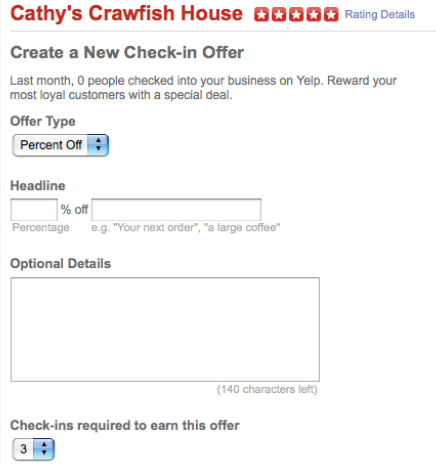 Yelp Check-In Offers: Over at SmallBizTrends last week I wrote about a few holiday gifts Yelp was offering SMB owners. One such gift is Yelp Check-In Offers, which gives business owners the ability to reward customers who check into their business via the mobile application. Each time a customer checks in, they can work toward unlocking special offers set up by the business owner giving them a percentage off, a fixed price or a free item. Because the goal of Yelp has always been to help users find the best business for their needs, these kinds of deals may prove to be quite lucrative for business owners. Yelp has also released better tracking to help SMB owners see which offers fare better and the traffic they’re getting. This is another avenue I’d really encourage small businesses to experiment with. FourSquare: FourSquare has established itself as the leader in location-based applications. As a small business owner, even if you don’t have grand plans to start using this yet, you at least want to make sure that your business is represented and that the information is accurate. Because even if you’re not using it, your customers might be and you want to make sure they can find you. To add your business, you’ll first have to create to create an account. Once you do, you’ll be able to add a venue to the site. Once set up, you can choose to use FourSquare to offer special offers for your business, to share tips for consumers or take advantage of its analytics to get actionable information about your business. If you’re just getting started with FourSquare, I recommend you check out the FourSquare Business Guide that’s available. If traditional search is all about links, then local search is all about reviews – getting them, making sure they’re good ones, and acquiring them from a bunch of different sites. This, in itself, is nothing new. Small business owners have been aware of the importance of reviews since Yelp, CitySearch and TripAdvisor first became popular. However, in 2011 reviews are going to take on a whole new level of importance. Why? Well, again, we can blame Google. As previously noted, on October 27 Google previewed a pretty major change they’ll be making to search results – essentially breaking down the wall that once existed between local search and traditional search. Now anytime Google deems your search to be of local intent, you’ll be shown not only local listings, but photos, star counts and the number of reviews directly in the search results under your listing. If that alone didn’t show you how seriously Google was taking results, on November 15 we saw Google Hotpot – Google’s very own online review platform. Google Hotpot is gathering the actual reviews, it’s also there to give Google the data that it needs to blend reviews with Social Search. 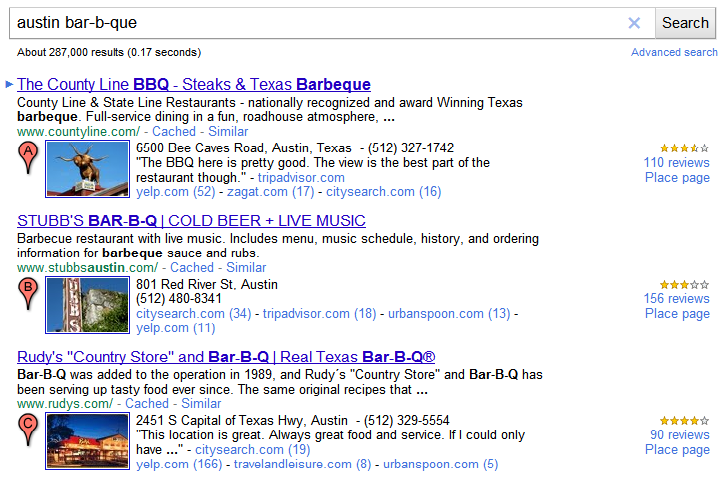 Check out how Google is already recommending local businesses based on a user’s friend recommendations. All signs are saying that reviews may become a stronger ranking signal in the future. And it may not just be the number of reviews, but the sentiment of that review that matters. As a small business owner, you need to be working on this now. Learn how to solicit reviews, how to manage reviews, how to respond to negative reviews and how to become an all-round review jedi before Google turns the switch. As a small business owner, these are the areas I’d be most focused on right now. If it seems like a lot for one person to handle, it is. Google’s is upping the ante when it comes to local search and the business owners must find a way to stay up to date.